Ideally located in the heights of the fishing village of Deshaies, classified 3 stars by the municipality of Deshaies. This house with vibrant colors will perfect your Caribbean holiday. Built in the Creole tradition, nestled in lush greenery, it consists of two bedrooms (one double, one with 2 single beds), a bathroom with separate toilet, large living room open to the outside (with sofa bed ) and an over-equipped kitchen (stove, microwave, coffee machine, large refrigerator and freezer, kettle, thermomix, toaster). Facing the sea, you will enjoy this peaceful part of life and well ventilated, the morning sipping your coffee on the terrace or evening lounging in the chairs. The large garden that stretches around the house offers a perfect playground for children and space for barbecue with friends. Next season, juicy mangos or the traditional bread to fruits will only be picked to be enjoyed immediately. If you want to find a little animation or swim in the turquoise water, the village of Deshaies and Grand Anse Beach are just minutes away. Finally though you are in a highly ventilated area, if you like very fresh the ceiling fans and air conditioning will be your allies. The house on the ground floor is accessible by all. 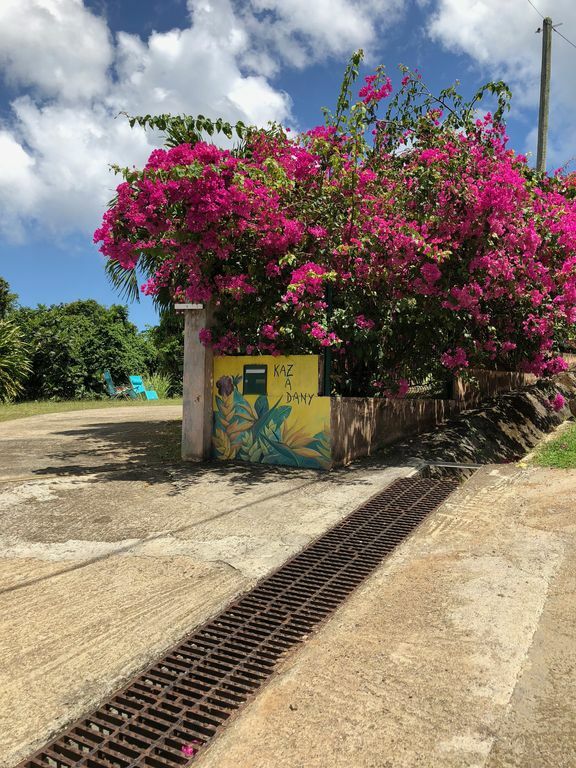 In short if you want to discover the beautiful Guadeloupe of Basse Terre, all in relief, wild, arborescent and colorful, to spend holidays with family or friends and have fun and relax, "la kaz a Dany" is made for you ". Suzy waited for us when we came late. She prepared a gourmet dinner for us. She was very helpful. The house has great options for a group or couple. The view is fantastic and I like the area very much. Comfortable house with great view! We stayed for a month at this sweet house near Deshaies. It is located high on a hill overlooking the sea. Therefore we had fantastic views of the sunset everyday. They even have comfortable chairs to sit out in the yard to watch the sunset and stars! The house is very well equipped in the kitchen with all the dish ware and culinary items you could imagine. The property manager, Suzy was wonderful and was there waiting for us, even though we arrived late at night and she had warm food and drinks for us. It was a wonderful welcome. The beds are very comfortable and we were given clean linens and towels each week. The house was spotless. It is in a very safe and quiet neighborhood. There is even a gourmet restaurant in walking distance that shouldn't be missed. On hot afternoons we enjoyed sitting in the shade under the two big mango trees enjoying the cool breeze. There were screens on the slats on the top of the window so ceiling fans made the rooms comfortable at night. AC is in the bedrooms if you need it. The only draw back was the steep drive up to the house but it's worth it when you get up there, for the cool breezes. It is not a walkable road down to the village. Beautiful beaches are a close drive away. I would highly recommend this lovely cottage for a wonderful vacation in paradise. Amazing Sea View in the Mountains! This house just up the mountains in Deshaies is absolutely wonderful! The house is cozy and charming, and the surroundings are quiet. You can see many stars. There are also hardly any bugs because the house is elevated being in the mountains. Dany and her friends we're wonderful to work with and made our stay very enjoyable! Nous voulons vous remercier d'avoir choisi notre maison, surtout vous remercier pour votre gentillesse. Nous faisons tout notre possible pour améliorer la qualité, et espérons vous revoir à nouveau. Séjour vraiment très agréable dans cette petite maison typique et tout confort, à proximité du centre et avec vue mer au milieu d’un très joli jardin. Nous avons été accueilli avec chaleur, une bouteille de planteur, des noix de coco, des accracs, et une bienveillance humaine très appréciée. Nous avons passé une agréable semaine dans cette location à DESHAIE proche du centre et où l'environnement est splendide avec vue sur la mer. Très beaux couchers de soleil garantis. Maison agréable et typique. Jardin bien entretenu. Avons été bien reçus par Suzy la cousine de la propriétaire qui est très disponible. Voisins en contrebas extrêmement sympatiques. Bon confort, mais il manque une clim dans le séjour, un peu chaud malgré le ventilateur au plafond. fishing village, with a reasoned tourism, typical or to live .In leaving the house you can make beautiful walks, for those who like walking, you will discover the rainforest, with its lush vegetation, and you will d pleasant discoveries of tropical plants ... Various gardens and discovery museums botanical garden, coffee, cocoa, rum, orchids ..., you discover cultures and traditions, tree climbing park and the tropical nature parks. Diving clubs, boats glass bottom of the Cousteau reserve, game fishing are leisure accessible to all ages. A Deshaies you will find everything for a peaceful holiday. Lulled by the Caribbean atmosphere. Enjoy delicious local dishes in small restaurants or to live. THERE are restaurants for every budget.